Horsham’s Missing Link – join us for a campaign photo! 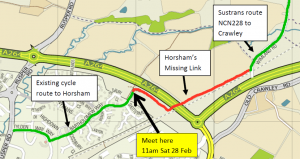 You are here: Home / Featured / Horsham’s Missing Link – join us for a campaign photo! We’re meeting for a campaign photo to show the level of support for completing the Horsham-Crawley cycle route.